“You can’t HANDLE the truth!” Jessup raged at the defense lawyer during a court-martial trial of two U.S. Marines. Nicholson’s words rang true this week, when several Nebraska Republicans made dubious comments and/or tried to cover their tracks on a variety of issues. We begin with U.S. Rep Bacon, who once-cozied up to GOP Rep. Steve King of Iowa — until King was roundly vilified for comments he made this week in The New York Times regarding White Supremacy and White Nationalism. 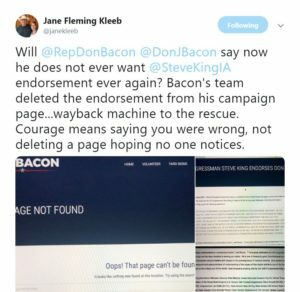 After King’s comments blew up, Bacon had his website scrubbed to remove information trumpeting King’s endorsement of his candidacy. This was not lost on foks, including NDP Chair Jane Kleeb. A Ricketts spokesman told the Omaha World-Herald that the governor had nothing to add to a statement from November, when Ricketts defended his support of King, saying through a spokesman that he disagrees with some things King has said. Over in the Legislature, Sen. Steve “To Hell With Separation of Church and State” Erdman introduced a bill to require that the motto, “In God We Trust,” be displayed in every classroom or school in Nebraska. One fault with that statement: The founding fathers did no such thing. It was a law passed in 1956 declared “In God We Trust” must appear on American currency. We would be remiss is we left this week’s edition of NebDems News without mention of the president* — whose ridiculous government shutdown over his demands for a wall on the U.S.-Mexico border rages on, doing increasing damage to workers and their families and the nation in general. “Most people who are innocent of any crimes will still need to hire thirty-five lawyers at some point, a new study shows. According to the study, commissioned by the University of Minnesota Law School, thirty-five is the ‘bare minimum’ number of lawyers that an innocent person should have on retainer in the event that he or she becomes the subject of an entirely unjustified criminal investigation. We found that many innocent people are going through life without taking the basic precaution of hiring thirty-five lawyers,” Professor Davis Logsdon, who supervised the study, said. “They are flirting with disaster. Additionally, Logsdon noted, hiring nearly three dozen lawyers is invaluable because of the powerful statement it makes. 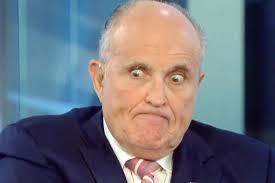 “Nothing says ‘I’m innocent’ like hiring thirty-five lawyers,” he said. 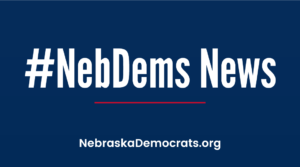 In closing, if you want to find the truth about the Nebraska Legislature, see our page on the NDP website, where we track important legislation and offer other helpful information.